Vale Industries, Inc. offers Mill Quality rugged, dependable equipment designed and built for years and years of service. Many Vale products have been in service for 25 years or more and are still operating. Vale offers shears capable of cutting up to 63mm diameter steel rod and bar for Steel Mills and Wire Processors and up to 89mm diameter copper or aluminum for Continuous Casting Plants. Upset Testing is the quickest and best way of detecting surface flaws in rod and bar. Vale offers 6 different size Upset Testers to cover the widest range of testing needs. Tensile Testing of sheet steel can be slowed down by the need to produce the tensile test sample “dogbone” shapes. 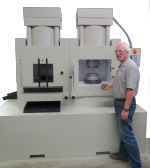 This procedure can now be expedited using the Vale Tensile Test Sample Press and Dies. 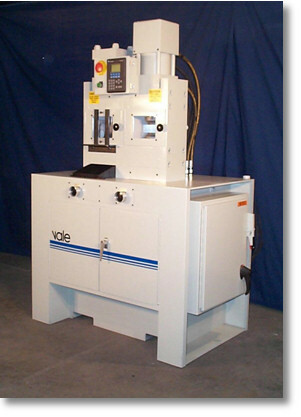 Vale also offers a complete range of Sample Punches to punch metallurgical samples from metal strip. Portable Rod Straighteners are used to straighten the leading edge of coiled stock so the wire can be easily fed into cold heading or drawing equipment. Manual Banding Coil Compactors provide an affordable option for compacting and banding wire coils. Compacted coils are easier to handle, cost less to ship and take up less room in annealing ovens. Upenders/Downenders are used to position wire coils from either vertical to horizontal or horizontal to vertical position. Each unit is custom designed to meet your exact requirement.